For other uses, see Eclipse (disambiguation). An eclipse is an astronomical event. It is when one object in the sky moves into the shadow of another such object. When an eclipse happens within a system of stars, like the Solar System, it makes a type of syzygy. This means that three or more objects in the sky are lined up in a straight line in the same gravitational system. 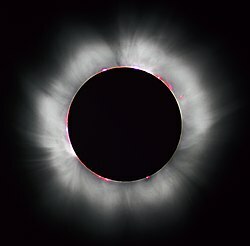 The term eclipse is most often used to describe a solar eclipse, when the Moon's shadow crosses the Earth's surface, or a lunar eclipse, when the Moon moves into the shadow of Earth. No solar eclipse can last longer than 7 minutes and 58 seconds because of the speed at which the Earth and Moon move. When the Sun is not involved, the event is called occultation. ↑ The New York Times (March 31, 1981). "Science Watch: A Really Big Syzygy". Press release. https://query.nytimes.com/gst/fullpage.html?sec=health&res=9F02E5DB1039F932A05750C0A967948260&fta=y. Retrieved 2008-02-29. This page was last changed on 3 September 2017, at 19:50.